With the stable and agile XT GTX Hornet you are, perfectly prepared to cope with good cushioning, protection and grip for every mountain trail. Lightweight, breathable and abrasion resistant processed materials in key areas, ensure greater breathability and comfort. For special security serve a lace bag to safely store the Quicklace lacing, a toe cap that provides side protection and a strong foothold, and a mud guard along the base of the shoe. 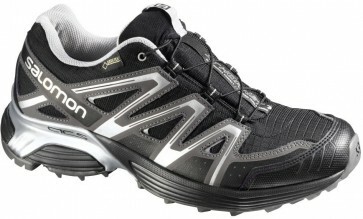 In addition, the shoe has the Sensifit system that wraps the foot, assuring a precise and secure fit. Gore - Tex Extended Comfort Footwear: Guaranteed feet dry and provides an extra comfort. This specially designed for strenuous activities material is in adventure racing and mountain running shoes, where excellent water resistance and breathability are paramount. Non marking Contagrip: The Salomon Contagrip outsole provides a balanced and tailored to the individual needs of special combination of rubber and thus ensures optimum adhesion to different surfaces. Moulded EVA footbed: Excellent cushioning and anatomical support. OrthoLite: OrthoLite sockliner combines a specific Ortholite foam and an EVA heel cup. OrthoLite foam for upholstery, cooler, drier, and a gedundes shoe climate. It is very durable and resistant. From recycled tire rubber to protect the environment. EVA heel caps provide more support and cushioning in the heel.